Charming and adaptable, Henry's Elfin uses a variety of habitats, and different host plants in different geographical areas. It has even added alien buckthorns (Rhamnus spp.) to its diet, a change which has allowed it to increase its numbers in New England. Henry’s Elfin has a wide range in eastern North America, from southern Canada to Texas and Mexico. Henry’s Elfin was routinely confused with Frosted Elfin and Hoary Elfin by early lepidopterists. Scudder, along with others in the nineteenth century such as Godart, described something called Incisalia irus, which could have included any of the three elfins mentioned, not just Frosted. Recently, much of Scudder’s description of irus has been determined to be a description of Henry’s Elfin rather than Frosted Elfin. The original descriptions of the larva and pupa of “C. irus” are found in Boisduval and Le Conte (1829 ), but they are from John Abbot’s notes and figures, which Calhoun has shown are actually of C. henrici (Calhoun 2004). Scudder's (1889) descriptions of the second, third, and fourth-instar larva, pupa, larval hosts, and feeding habits of “C. irus” are taken from W. H. Edwards’ notes on C. henrici, and the larva and pupa figured in Scudder are reproduced from Abbot’s drawings of C. henrici in Boisduval & Le Conte (Calhoun 2004; Albanese et al., 2007b). As a result of this early confusion, we know hardly anything about the abundance or distribution of Henry’s (or Frosted or Hoary) in Massachusetts at the turn of the century, except that all three species were thought of as rare. But through retroactive museum determinations, we can be reasonably certain that there were at least two pre-1900 locations for Henry’s Elfin in the state: Waltham and Wollaston. 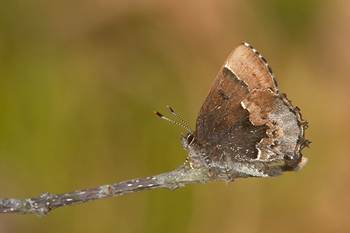 (Frosted and Hoary Elfins were also found in Waltham prior to 1900.) There are at least ten 1897 specimens in the MCZ and the AMNH, taken in April and May in Waltham by C. Bullard, and three specimens in the MCZ retroactively labeled Henry’s collected in Wollaston (Quincy) in 1878 and 1897 by F. H. Sprague. There were also several locations for Henry’s Elfin in eastern Massachusetts between 1900 and 1950, as indicated by museum specimens, and then a great increase in reports and locations beginning in the 1960’s. Examination of a large dataset of Massachusetts elfin museum specimens reveals that for eastern Massachusetts there are retroactively-identified 1900-1950 specimens from Concord (1914, W. Reiff, SI), Wayland (1920, 1921, C. J. Paine Coll. MCZ), and Sudbury (1926, C. J. Paine Coll. MCZ), and many specimens from Fall River in the 1930's and 1940's (1930-1935, W. P. Rogers, AMNH; 1943, 1944, 1946, D. J. Lennox, UNH; 1948, W. P. Rogers, Yale). The number of locations is smaller than the number of locations for Frosted Elfin or even Hoary Elfin for this time period. The first report for Cape Cod appears to be a 1952 specimen from Barnstable (C. P. Kimball collection) in the Harvard MCZ. There are no reports from the Islands, as there were for Frosted and Hoary Elfins. Jones and Kimball (1943) do not record Henry's Elfin as present on Martha's Vineyard or Nantucket, and it is still not found there today. Reports and specimens of Henry’s Elfin expand dramatically in the mid-1960’s, probably reflecting the adoption of buckthorns as host plants. In May 1964 J. D. Turner captured a specimen in Sherborn, which is now in the McGuire Center in Florida. In May 1965 Charles G. Oliver took a female specimen in North Acton on May 6, which he thought [erroneously] “may be a new record for Middlesex County, Mlassachusetts.” That specimen is now in the Yale Peabody museum. Another capture was reported June 1, 1966 in Framingham, by J. W. Cadbury and C. Curtis. The first report for Essex County, and a bona fide new record there, came in 1967, when James P. Holmes captured 2 males and a female on May 21, 1967, and another female on May 28, all in the town of Essex. He says that these 1967 finds are his “first personal record of this scarce species.” He found another the next year, 1968 and another in 1971 (LSSSC 1965-71). Holmes had collected intensively on Cape Ann for two years prior to 1967, and not found this species. The first report for the Connecticut River valley area comes in 1963, with a specimen, now in the MCZ, taken on June 3 in the vicinity of Mount Tom, north of Holyoke, by John M. Burns, E. Hanson and D. Hottenstein. The species may still have been uncommon in that region, because P. Carey did not find it, despite collecting in the Springfield and Mt. Tom areas in 1972 and 1973. The 1970’s were punctuated by more finds in eastern Massachusetts south and west of Boston. J. Ingraham found Henry’s Elfin in Needham, Dover and Dedham in 1973 (Yale, MCZ, LSSSC 1973). Dave Winter found it in Needham in 1973 and Wellesley (Babson Park) in 1974 (MCZ and AMNH specimens). And D. Willis reported Henry’s Elfin as a “new species” in the Holliston-Sherborn-Framingham area in 1974 (LSSSC 1974; location probably the Sherborn power line). After 1974, the Babson College site in Wellesley became a favored collecting location, and there are many Wellesley specimens extant: 1976 W. Winter (LSSS); 1974, 1976, 1977, 1980, R. Robbins (Smithsonian); 1979, 1980, E. Williams (pers. coll. ); 1984, R. Godefroi (McGuire). In 1979, R. Busby reported Henry’s Elfin from Needham and North Reading (LSSSC 1979). In 1980, C. Shiffer collected a specimen in the Blue Hills Reservation (Milton and Canton) (McGuire). In 1985, the dramatic discovery that Henry’s Elfin had switched to introduced aggressive buckthorns was made at the Wellesley site by Dale Schweitzer (see below). Henry’s Elfin appears to have increased in eastern Massachusetts since about 1965, probably as a result of its adoption of this widespread plant, and is so listed on Table 2. Throughout its wide geographic range Henry’s Elfin uses a number of different host plants, but usually only one or two in any given area. On the mid-Atlantic east coast the two main hosts are Redbud (Cercis canadensis) and American Holly (Ilex opaca). The redbud-feeding populations are mainly in rich forested areas inland and in the Appalachians, while the holly-feeding populations are along the coastal plain, especially New Jersey north to Rhode Island. But Massachusetts is north of redbud’s historic range, and American Holly is found here mostly on Cape Cod and the Islands. Massachusetts is where Henry’s Elfin was first shown to have switched to exotic, aggressive buckthorns, both Rhamnus frangula (=alnus) and R. cathartica, as host plants. Today buckthorns are probably its most common host here. In 1985 Dale Schweitzer first reported from a site in Wellesley that females commonly sat among thickets of R. frangula, and several ovipositions were observed on the flower buds. Photos by Dave Winter of the larvae on R. frangula in Wellesley in July 1985 are in the MBC slide collection (click here to see one photo). At the same location, females did not rest on or oviposit on 3-4 abundant species of blueberry. The larvae ate blossoms and berries of Rhamnus, even the foliage, and successfully pupated. In another nearby area studied by Schweitzer, there was no other likely native food plant around except Nemopanthus[Ilex] mucronata, or mountain-holly, which was abundant and in Schweitzer’s view was the most plausible candidate for a native, pre-Rhamnus food plant there (News of the Lepidopterists Society, 1985; Kirk 2003; Stichter 2011). Thus the original native host plant in Massachusetts may not have been American Holly but the closely related Nemopanthus mucronata, or Common Mountain-holly (Schweitzer, Lep.Soc.Seas.Sum. 1985; Kirk 2003). This species is used as a host plant in New Brunswick, and was abundant near the site where Henry’s was first discovered using the introduced Rhamus spp. On the other hand, the original native host might have been blueberry (Vaccinium) and huckleberry (Gaylussaca) species, which are also common hosts in Canada (Kirk 2003). There is very little actual evidence for Massachusetts. Scudder thought the native host plant was Vaccinium. In Rhode Island, the species probably uses American Holly, since it is usually found associated with it, but it is also found in areas without holly (Pavulaan, quoted in Kirk 2003). Mello and Hansen thought that Henry’s Elfin might use Ilex on Cape Cod (Mello and Hansen 2004), but there is no real evidence. Henry’s Elfin is one of a surprising number of butterfly species which have switched to non-native hosts during historical times, and may be the only local elfin to have done so (Table 3). It uses Rhamnus both in our area and in Ontario and Nova Scotia and perhaps other areas. The switch has been coincident with an increase in the abundance of this species (Layberry et al. 1998). Henry’s Elfin does not make as much use of open areas as do other elfins, being found usually in forests, forest edges, or tall shrub swamps where one of its host plants is present. The Atlas found Henry's in only 29 of the 723 blocs searched, making it “Uncommon.” MBC reports 2000-2007 rank it similarly, at the lower end of “Uncommon” (Table 5). It is not as frequently reported as Hoary Elfin, but Table 5 does not include the post-2007 increases in sightings. Henry’s is reported from a larger number of towns, and is more widely distributed, than Hoary (see map below). 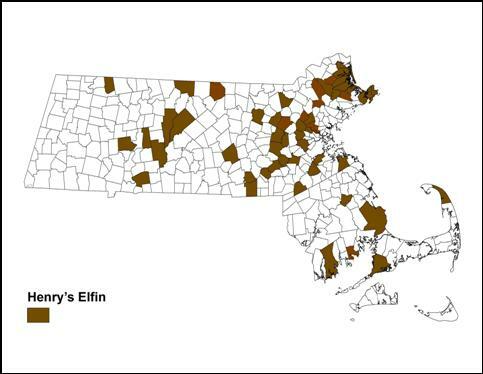 Henry's Elfin is probably increasing in Massachusetts. There is an upward trend in MBC sightings of this species, 1992-2009 (Chart 27), which is most evident in 2008 and 2009. Until then, fluctuations every few years seemed to be the norm. A similar finding comes from a list-length analysis of these same MBC data, which showed a statistically significant 175% increase in detectibility for Henry's Elfin over the 1992-2010 period (G. Breed et al. 2012). Further illustration of the trend comes from statistics published in the Massachusetts Butterflies Season Summary: the average number of Henry’s Elfins seen on a trip in 2007 was down 60% compared to the average for preceding years back to 1994, but was up 126% in 2008, and 386% in 2009 (Nielsen 2008, 2009, 2010). The large increase in 2009 is mainly due to one report of 25 from Fowl Meadows in Milton. While this report is probably a good estimate, it is the first report in MBC records to exceed 8 at any one site. Even excluding that report, the trend through 2009 is still upward. The years 2010, 2011 and 2012 saw continued increase in the total numbers of Henry's Elfins reported, though fuller analysis remains to be done. Henry’s Elfin is found almost solely in the eastern part of the state and around the Quabbin Reservoir in central Massachusetts. There have been very few found on Cape Cod, none on the islands, and none in Berkshire County (Map 27). Henry's Elfin has not been found 1991-2013 in the Berkshires, either north or south, or in nearby western towns, except for one report of a single 5/25/1998 in Heath, D. Potter, which is shown on the map but is uncertain and needs reconfirmation. Nor did the 1986-90 Atlas find this species in the Berkshires. There are apparently three specimens from the 1950's labeled "Henry's Elfin, Tyringham" in the Berkshire Museum, but the August dates are not within the flight period for this species, so these cannot be accepted without further explanation. Henry's Elfin is also not reported from the northern Connecticut River valley. Map 27 greatly extends the limited distribution shown in the 1986-90 MAS Atlas. MBC reports now extend the range into the central area of the state around Quabbin Reservoir, and into the southern Connecticut River valley. It is not clear whether the butterfly’s range expanded since the Atlas years, or whether more intensive searches are the cause, but range expansion is likely. The Atlas had no reports from central Massachusetts, but there are multiple MBC reports from Worcester, Petersham, New Salem, and Belchertown. For the southern "valley" towns, the Atlas had a single report from Hampden (4/24/1990, K. Parker), to which MBC records add a few more reports from Springfield, Northampton, and especially Amherst. The Atlas had only one report from Cape Cod, from Mashpee. MBC reports now show Falmouth (Crane WMA) and Truro (Pilgrim Heights) to be good locations for Henry’s Elfin. Mello and Hansen (2004) suggest several other possible locations, but call the species elusive on the Cape. It apparently has not been found at Ashumet Holly Reservation in Falmouth, despite the presence of a possible host plant. Henry's Elfin still has not been reported from either Martha's Vineyard (Pelikan 2002) or Nantucket (LoPresti 2011). If we compare these MBC reports to the locations known for Henry’s Elfin in the 1970s and 1980s, both prior to and during the Atlas, a marked expansion in the geographical distribution (range) and number of towns is apparent. Map 27 shows MBC reports from 53 towns; MBC records for the same time period show Frosted Elfin from 37 towns and Hoary Elfin from only 10 towns. Compared with these other two elfin species, Henry's is found in a greater number of towns, and by this measure is the most abundant of the three elfins. Acton Fort Pond Brook, 8 on 4/26/2008 J. Forbes; Falmouth Crane WMA, 2 on 5/21/2011 A. Robb; Harvard Oxbow NWR, 4 on 5/3/2003 T. Murray and E. Nielsen; Ipswich Willowdale SF, 5 on 5/11/2002 F. Goodwin; Lexington Arlington's Great Meadow, 6 on 4/29/2012 T. Whelan et al. ; Medford Middlesex Fells, 3 on 5/7/2011, M. Arey; Milton Fowl Meadows, 25 on 4/24/2009 S. Jaffe, 8 on 4/28/2013 R. and S. Cloutier; Newbury Old Town Hill TTOR, 2 on 4/22/2008 S. Stichter; Newburyport Plum Island, 2 on 4/20/2004 R. Heil, and 2 on 5/15/2004 C. Kamp (MAS Atlas lists a high of 8 on 30 April 1994, Plum Island); Sherborn power line, 7 on 5/7/2011 B. Bowker et al. ; and Truro Pilgrim Heights, 5 on 5/7/2000, A. Robb. Henry’s Elfin is single-brooded throughout its wide continental range, flying for a little over a month. The onset of flight is earlier in southern regions; for a comparison of flight periods in different regions, see Kirk 2003. In Massachusetts Henry’s Elfin flies mainly from mid-April to the end of May according to 1993-2008 MBC records (http://www.naba.org/chapters/nabambc/flight-dates-chart.asp). There is no information from Scudder on flight dates in the 19th century due to the confusion over species identification. Earliest Sightings: In the 23 years 1991 through 2013, the four earliest "first sighting" dates are 3/23/2012 Georgetown power line, M. Arey; 4/4/2010 Plum Island, E. Nielsen; 4/13/2002 Plum Island, B. Walker; and 4/15/2000 Topsfield Ipswich River WS, F. Goodwin. The Atlas also reported an early date of 4/15/1986 Wilmington, S. Goldstein. Interestingly, all of the early reports are from Essex County. In 15 of the 23 years under review (1991-2013), the first butterflies were reported on or before April.24. Henry’s, Hoary and Frosted Elfins generally appear about the same time, with Frosted peaking a little later than the other two. Latest Sightings: In the 23 years 1991 - 2013 the four latest "last sighting" dates are 6/8/1997 Falmouth Crane WMA, J. Sones; 6/7/2009 Holliston Brentwood CA, B. Bowker; 6/6/1999 Falmouth Crane WMA, A. Robb; and 6/4/2011 Newbury Martin Burns WMA , S. and J. Stichter. These are the only June "last sighting" dates in this period; in the rest of the years, the last sighting date was in the third or fourth week of May, not in June. The Atlas had reported a similar June last sighting date, 6/7/1988, North Dartmouth, M. Mello. Flight Advancement: Unlike Brown Elfin and Eastern Pine Elfin, Henry's Elfin does not seem to have advanced its flight time significantly during the years 1986-2009, according to a 2012 study done at Boston University using MBC and Atlas data (Polgar, Primack, et al. 2013). However, later calculations using 1986-2012 data showed significant flight advancement by Henry's Elfin: about 12 days over this period (Williams et al. 2014). Like most elfins studied, Henry's Elfin also shows a statistically significant response of flight time to temperature variations in the two months prior to emergence (March, April), varying its flight time by 3.86 days for every ºC change in average spring temperature. This responsiveness to temperature is an adaptive trait. Because of its use of aggressive and widespread buckthorns as host plants, Henry’s Elfin is expected to become more common in Massachusetts. In addition, as a largely southern-range species, Henry’s Elfin may continue to increase in numbers and range in this state due to climate warming (Table 6). Its present NatureServe rank in the state is S4, or apparently secure. Interestingly, in Connecticut, Henry’s Elfin’s rank is only S2S3, and it had not been found in the state for some 30 years prior to the start of the Atlas in 1990. Only 3 project and 4 pre-project specimens were found, and it is not clear what the host plant is in wild (O’Donnell et al. 2007).